I think it is a Wheaten Standard Old English Game Fowl but I don't know so I need your Help I really like to know what kinds Game Rooster? I has? Mickie is a Buff Orpington and Dominique mix the mom is a Buff Orpington and the dad is a Buff Orhington and Dominique mix. 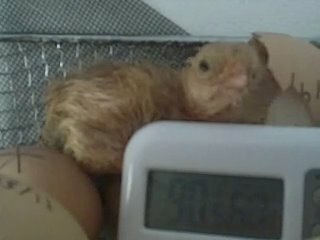 I hatched her on 2/9/11 at 8:23am from my Homemade Incubator. Snooki is a Buff Orpington and Dominique mix the mom is a Buff Orpington and the dad is a Buff Orpington and Dominique mix. 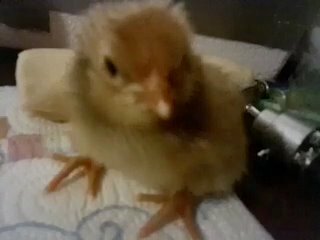 I hatched her on 2/9/11 at 9:00pm from my Homemade Incubator. I love taken care of my Roosters and Hens I have 22 Chickens in all I have 6 Roosters and 11 Hens 5 Baby Chicks, 2 Baby Ducklings, 2 Rabbits. 1 of my Rooster is a Gallo Kelso or Game Rooster. 2 Roosters are a Buff Orpington and Dominique mix the mom is a Buff Orpington and the dad is a Dominique. I have a Reds Hens name Ms. Red Warrior I don't know what kinds of hens she is Ms. Red so I need your Help I really like to know what kinds of hens Miss Red is??? 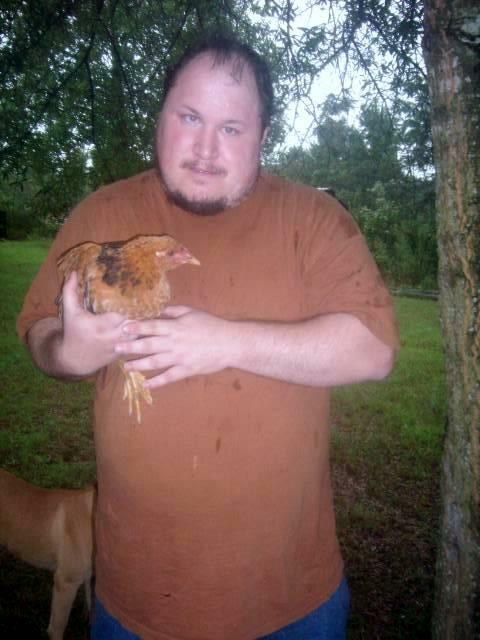 So Please watch my videos to see Ms. Red plz writre me if think or know leethechickensguy@yahoo.com Thank you. So I 3 more Hens 1 name Highlight she is a Brown Red Old English Game Hen she about 8 Months old. Other 2 Hens are a Wheaten Old English Game Hens they are about 8 months. 3 of the Hens are a Black Australorp they are about 1 year name Elvira, Robin & Pokie. I got my 1st. egg from her on Dec.20,2010. 3 of the Hens are a Buff Orpington they are about 1 year the one in the pic is Butter Cup, other 2 are name Sunny & Sunshine. I have 1 Rooster 1 1/2 years old Gallo Kelson Rooster name is Magnum, 2 more Roosters they are a Buff Orpington mix with Dominique Roosters name is Checkers and Fire Ball 6 Months old. so I need your Help I really like to know what kinds of hens Ms. Red is??? So Please watch my videos to see Ms. Red Thank you. So I have 3 more Hens 1 name Highlight she is a Brown Red Old English Game Hen she about 8 Months old. Other 2 Hens are a Wheaten Old English Game The Hens are about 8 months old. Also Im looking for old Chicken Cage, Rabbit Cage or Chinken Coop with pen you dont want no more or anything Please let me know I can use all the Cage I can get ok. Here are my 2 new Roosters name Checkers and Fire Ball Roosters are a Buff Orpington and Dominidue mix the mom is a Buff Orpington and the dad is a Dominique. Here are the Hens 1 name Highlight she is a Brown Red Old English Game Hen she about 8 Months old.